A Six-Year, Constipation Battle To End Abruptly - Oxford Biomedical Technologies, Inc. It has been a little over 6 years ago since I started my “battle” with constipation, bloating, inflammation, weight gain, among other uncomfortable symptoms. I have tried Carbohydrate Specific Diet, Whole 30, elimination diet, going to a GI doctor, taking meds, relying heavily on Miralax, and nothing seemed to work. I found Lisa Brown after talking to a friend about functional medicine and looking for a more holistic approach to nutrition. Before calling her I had only heard of MRT, but knew nothing about it. I felt so relieved after talking to her and realizing that I am not alone in my struggle, that others too have had similar symptoms even after “trying everything”. After our initial consult I dove into researching more about the MRT test and LEAP program. The science behind the testing and the fact that the company uses trained dietitians made me feel very hopeful that I was moving in the right direction. I had started to wean myself off of Miralax which I relied on heavily to keep myself “regular”. I never imagined that after just 4 days of starting LEAP I would finally be able to have a bowel movement on my own. After 6 years of being dependent on Miralax I had found a cure! I am currently in my 4th week of following the protocol and a lot of my other symptoms are either gone or have improved drastically! 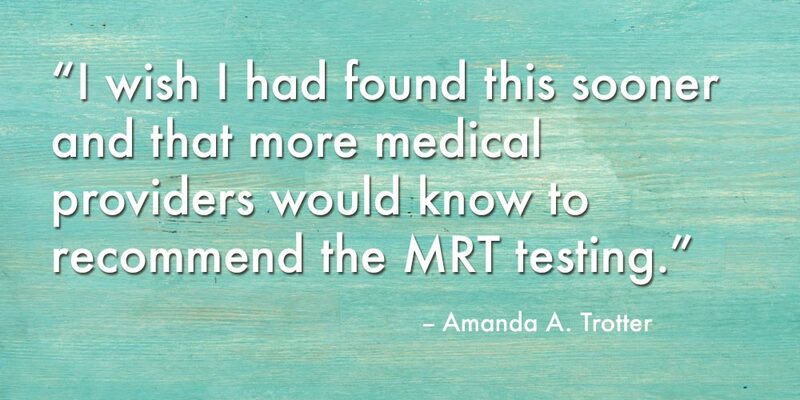 I wish I had found this sooner and that more medical providers would know to recommend the MRT testing. I am so grateful to Lisa and to the people who have studied food sensitivities and created this test. Because of them, I am finally on a path to healing! The above is a testimonial from a client of Lisa Brown MS, RD and Certified LEAP Therapists. A quick 4-step tour clearly explaining food sensitivity plus a Complementary Patient Prescreening. A quick 4-step tour clearly explaining food sensitivity plus a Complementary Patient Prescreening if you are currently experiencing chronic unresolved health problems. The LEAP program was the best investment I could have made. After four months, my symptoms have completely resolved.